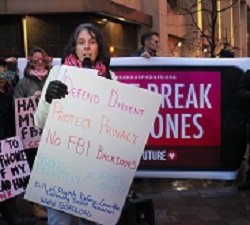 Fight for the Future protesters gathered outside the FBI building in Washington, D.C., on Tuesday night to stand in support of Apple against an FBI court order. “We call on the FBI, the Justice department, the Obama administration to drop these demands. And we call on them to not exploit terrorism and tragedy to undermine everyone’s privacy and security,” said Craig Aaron, CEO of lobbying group Free Press. The court order demands that Apple create a program that would allow FBI officials to access the San Bernardino shooters’ phone. Apple CEO Tim Cook refused to comply with the order, creating a standoff between the company and the FBI. Despite cold and rainy conditions, the protest drew noticeable numbers as well as press coverage. “Given that it’s raining, I felt very good about a lot of people out here, and a lot of cameras and microphones as well. And these are happening in 40 cities across the country, it’s not just here in D.C.,” Aaron said. Speeches at the protest shifted between the concern of a government compelling a private company, and the government’s potential to invade privacy. The protest drew a wide array of participants, including Black Lives Matter organizer April Goggans. In a speech made at the protest, she said this issue was not just about personal security, but also about citizens’ ability to protest freely. “I know here, as a Black Lives Matter protester, the more that I do, the more the Metropolitan Police Department has increased their surveillance. To the point that our Twitters don’t work if there are more than four of us in the same place,” Goggans said. “I want to make sure that you remember communities that aren’t always represented in these spaces, that their security is just as important,” she added. The protest organizers ended the demonstration by thanking the protesters, press, and FBI security staff.